To round off an afternoon of wine tasting, the Dalmacija Wine Expo brings in some of Croatia’s best chefs to prepare dinner at local restaurants. The menus of these Culinary Stars are published online, so you can choose in advance which of these gastronomic feasts you want to indulge in. Not an easy choice, as they all sounded marvellous! 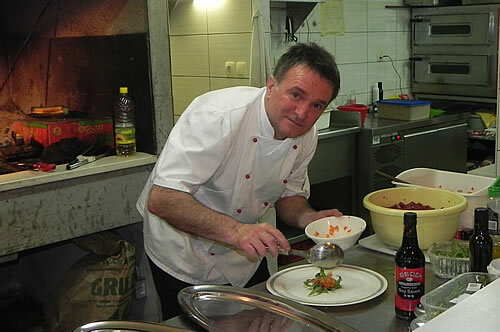 We opted for chef Braco Sanjin, usually in charge of the kitchen at the Restoran Kadena in Split, but for the duration of the Wine Expo weekend, he was cooking at the Restoran Bura in Makarska. 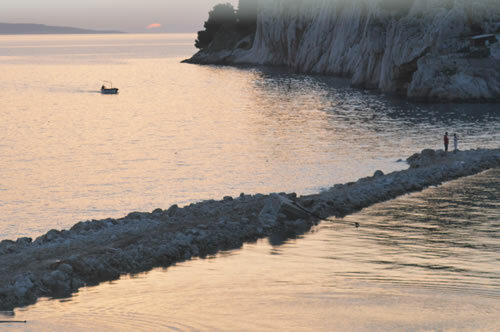 The Bura restaurant is on the little headland, curving back at Makarska across the harbour. As we walked along the waterfront to get there, the sun was just slipping below the horizon and the sky glowed a soft pink. What a lovely evening, so peaceful. But as we approached the park at the far end of the bay, there seemed to be a lot of activity and was that a stage with enormous loudspeakers? Quite a few people in leathers were sitting around enjoying beer and hot dogs, while playing in the background was everyone’s favourite rock music from the late 60s. Boooooorn to be WIIIIILD!! Hmmm, we’ve either entered a timewarp or we have a biker convention going on, not 50 metres from our restaurant. And the fairly muted recording of oldies was about to be replaced by a live band who were by now making stuttering tune-up noises – oh, dear! Arriving at the restaurant, we debated whether to sit outside and enjoy the rather beautiful view… or to retreat inside away from the noise. But what the heck, let’s enjoy our aperitifs watching the twinkling lights of Makarska against the increasingly dark bulk of Biokovo. We can always move inside later if it all gets a bit much. But as the band got started, we realised they were actually pretty good. Old style rock and roll is a fun reminder of our own youth, so long ago! And it made an interesting background to the meal when each new group of bikers would arrive with a vroom, vrooooooom, VROOOOOMMM and much staccato back-firing. Bang, bang, bang, b-bang-bang-bang-BANG, BANG!!! Different. 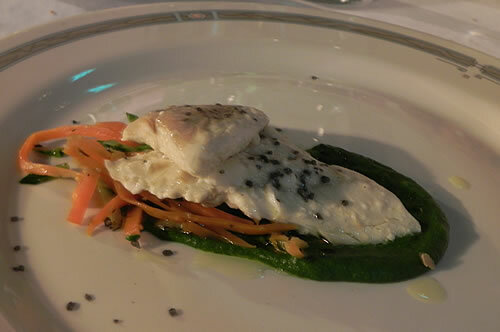 Wonderful, wonderful food, all beautifully cooked and presented. The flavours were so fresh and the combinations just perfect. 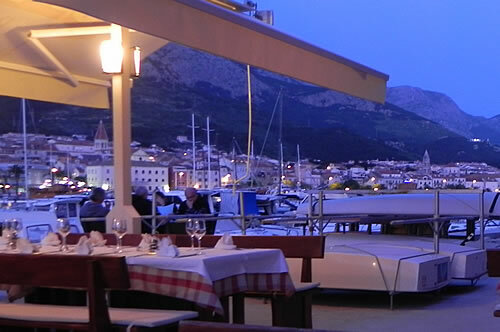 I obviously need to go and find the Restoran Kadena in Split, and see what chef Braco Sanjin has on the menu there! 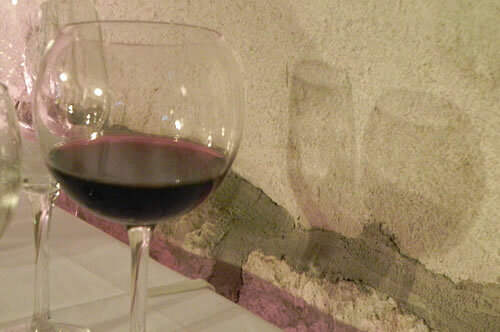 A glass of Plavac to go with the food! In fact the whole evening was a deliciously memorable experience, including the restaurant, the lovely location, and of course that soundtrack of live rock music and back-firing motorbikes!